Both of us had quite a flurry of men after we had both ended long-term relationships, both with white Catholic guys. I was married for 7 years and Mark was with his lover for the same amount. 2010 seemed like the time to buckle down and find the man that our mothers always hoped we would. In a previous post, “Heckling At The Matzo Ball With Cocoa Butter Mark,” I end with our very short-lived desire and effort to join JDate. I was in my sunroom lounging on a chaise, glass of wine nearby, laptop on my, well, lap, and Mark was undoubtedly at a Starbuck’s, complaining about noisy kids, with his laptop on a table. We said, “One, two, three, GO!” and logged on to the registration page simultaneously. “What am I?” Mark asked? a) I keep kosher, of course. That way I get to have 2 sets of Crate and Barrel dishes! b) I put bacon on everything. c) I’m on a liquid fast. a) HELLO, I was bar/bat mitvahed in Israel! b) Never. I’m too afraid to fly. At this point, I knew I wasn’t the type of Jew they were looking for, and after a quick search of “Men seeking Men,” Mark decided that he wasn’t either. We gave up and went on to talk about other more pressing things, like who got eliminated on Project Runway or the cute black bartender we both had a little crush on at our favorite dive bar. Onward and upward! We have both found true love in these incredible men. Everyone adores “The Nunez” and Ricardo Rodriguez. Mark and I have never been happier. He told this story at my wedding celebration and of course brought the house down (when he wasn’t tearing up as he is known to do). We have no regrets for closing out “The Year of the Jewish Husband.” We adore our spicy Latino men for everything they are and we love that we still bring out the “Jewish” in each other, throwing around the occasional Yiddish phrase while the men look on and grin. At 46, I have officially begun the second chapter of my life, with a love that will endure through my “middle ages” and beyond. My life was changed that fateful day. I knew I was in trouble…the good kind! I remember getting to the restaurant early to make sure that all was perfect. I remember ordering two shots of Patron (on ice)…just like you wanted. I remember seeing you drive in. Me coming out the door. You getting out of your car. You looking across the parking lot right at me. And your incredible smile! A beautiful beam of light. I remember half walking / half running to you. Taking you in. The first touch and kiss. Passionate, yet gentle and kind. I remember your scent (don’t ever change it…it’s you!!!). I remember how nervous I was. How you helped me to feel at ease. Drinking that shot. I remember how incredibly beautiful you looked that night. I remember the most wonderful dinner of my life. Getting to know about you. How I couldn’t think of any place that I would’ve rather been at that moment in time. I remember how I didn’t want it to end. And, most important, how happy and care free I felt right then and there….with you. That night, I fell in love with you! You, Gayle, have made me a better person. You made me face my evils and deal with them head on…one by one. You have made me happier than I have been in a long, long time. It’s been difficult at times. I thank you for your patience, kindness and compassion. You gave me my life back. Because of you I’m closer to Danny and Alex than I have ever been. Because of you I have tried so many new things…getting me out of my very limited comfort zone. It’s your amazing joy of life that I love the most. How even in my most challenging situations you have the ability to bring me back to center. No matter how dark I see the situation you always make me see the light on the other side. I’m thankful to you for bringing Amelia into my life. How privileged I feel that you found me important enough to take that step…To have me meet the most important person in your life. I’m thankful for embracing Alex and Danny as you have. How you have become a second mother to them. How you have made them feel comfortable and at ease and that everything will be OK. And, that they see just how happy you have made me. How you have made a home for them where they are always welcomed. I thank you for embracing my family and friends. And in turn, how you have made me part of your family. I thank your family for embracing me the way they have. I have really enjoyed the time we have spent together and look forward to many more good times. I thank you for introducing me to the most important people in your life. Some of which are here today. Your friends are your life. I’m honored, considering the place that some of them hold in your life. Now, on to the vows…. These things I promise to you unconditionally. I’m incredibly happy to be your husband. I’m incredibly lucky to be your partner in life. I love you so very much. By now, I think everyone here knows how we met. After months of online dating profiles of men who had pictures of themselves holding up big fish and those who couldn’t complete a sentence if their lives depended on it, along came you with that open smile and complete paragraphs, not a spelling error in sight. You were a match.com member for less than 24 hours and there was no way I was going to let another woman get to you first. So, in proceeding to instant message each other, e-mail and talk on the phone, I knew that by the time I met you, we were already under each other’s skin and it would have taken something very dramatic and unexpected to extract ourselves from our quickly-beating hearts. I remember reading to you over the phone, even before we met met in person, that list I made of the qualities I wanted in a man, from the most mundane to the most critical. We were both stunned into silence, because besides just 2 of about 40, you clearly fit the bill. And now, not only do you DRINK coffee but you make a better pot than I do, and you podcast Wait Wait Don’t Tell Me. You’ve often told the story of seeing me across the parking lot for the first time. Well, I saw you too, as I approached to where you were waiting and I too knew that something big was about to happen. What an amazing first date. I will NEVER forget watching the stars through your open sunroof, leaning into you like I had known you forever. On our next date, we sat side-by-side making a list of all the places we wanted to go together on road trips, both near and far. We’ve added a LOT of things to that list, from get Gayle a Mac to driving across the country in a Winnebago with the kids, to getting to Spain someday. I have absolute faith that we will do it all. Einstein says that the definition of insanity is doing the same thing over and over and expecting different results. Well, having been drawn to chaos for most of my life, gravitating apparently to what I knew, according to Einstein’s definition, I am no longer insane. You have brought a sense of calm into my life that I always knew I wanted, but never thought I’d find. I am being taken care of for the first time, and after a life of figuring it all out for myself, I am ready to relinquish control, no easy feat for me, to you, the most capable man I have ever known. I in turn, have never wanted to do so much for someone, to ensure you, that you too, will always be taken care of. I love observing you in your “happy places”–at the helm of your boat, laughing until you cry while watching guy stuff with the boys and assessing a perfectly vacuumed room. You make me believe that anything can happen and boost me up when I have lost confidence in myself. I promise to always do the same for you. I can speak to you all day and still light up when you walk in the door. I still walk around like a teenager, knowing that we have found a remarkable love. Even if times get tough, that is what will bring me back around-thinking of those ear-to-ear grins that we have shared just by looking at each other. We are lucky. 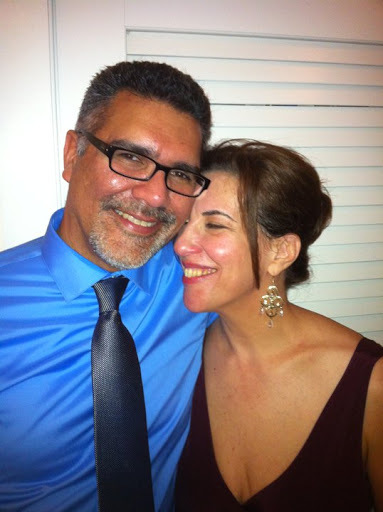 We can never forget how lucky we are in having found each other- a nice Jewish girl from Long Island and a Puerto Rican guy from the middle of nowhere in New York.